Sydney is a town that loves to eat out, we’re obsessed with where the new/hip/hot/solid/awesome/novel place is. But amazing food and great service are not the only ingredients that make up a great meal. All too often there’s one very important element missing – true hospitality. And that’s where Mi Casa Su Casa comes in, a shift towards a different kind of dining – eating in. Mi Casa Su Casa is a speakeasy-style/in home restaurant run by Georgia peach SarahKate with the help of her husband, Andy, aiming to bring a little bit of southern hospitality to Sydney. The restaurant runs a couple of times a month and seats ten guests, the idea being to bring people together to share a meal and get to know each other. Although underground dinners, twEATups and so forth are all the rage these days, it’s one of the first true in-home restaurants in Sydney. 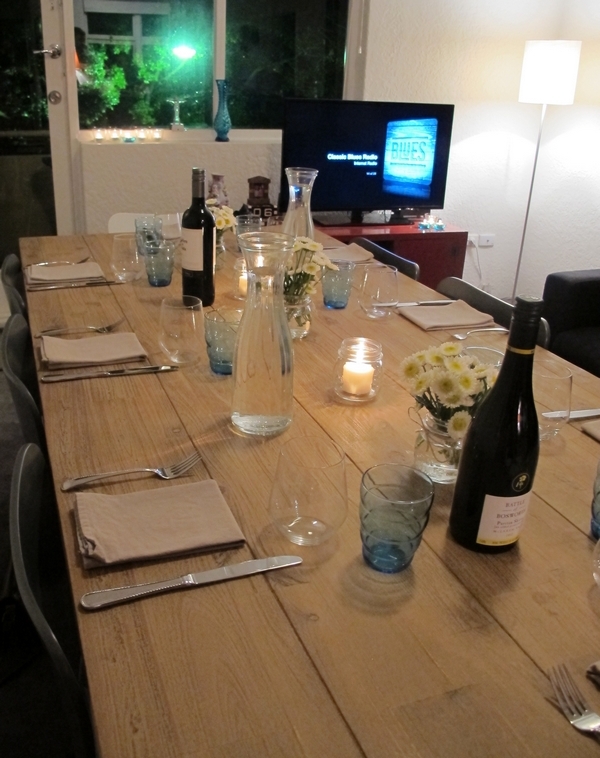 You have to admire someone who has the guts to invite ten perfect strangers into their home for a meal. 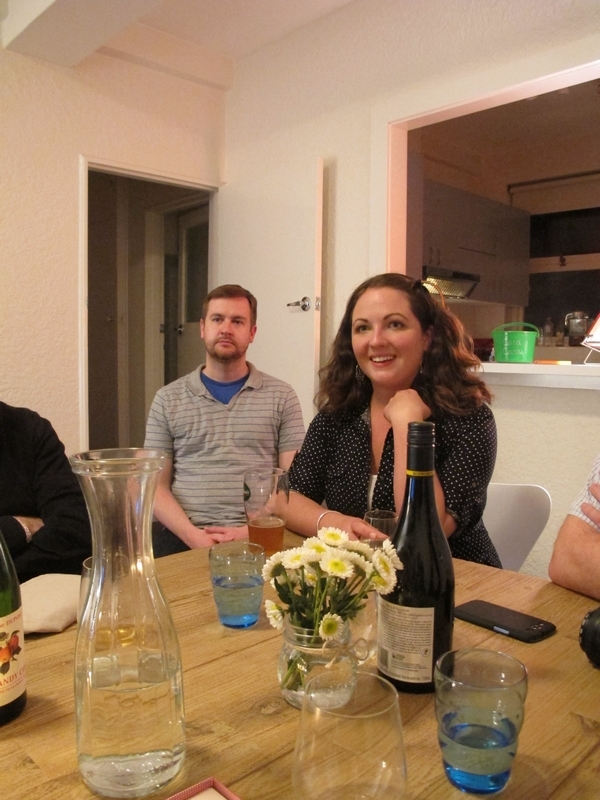 However, as this was preview dinner made up of food bloggers, most of us had met before. John, Anna, Hayley, Mel and I, along with our plus ones where applicable, all arrived more or less on time that night despite the weekend trackwork. Our coats and bottles of wine taken and drinks pressed into our hands (spiked sweet tea with mint and rum, yum! ), we were ready to begin. 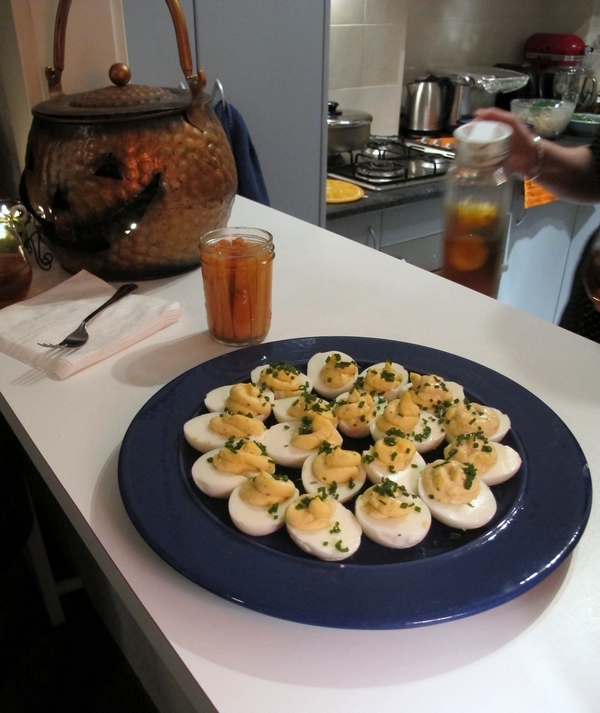 We started with some general milling about, small talk and deviled eggs, which were delicious. There were also some homemade dill pickled carrots on offer, but I sort of forgot to try them in the rum-spiked haze. In any case, I knew there was a big southern dinner on the way and I needed to pace myself. 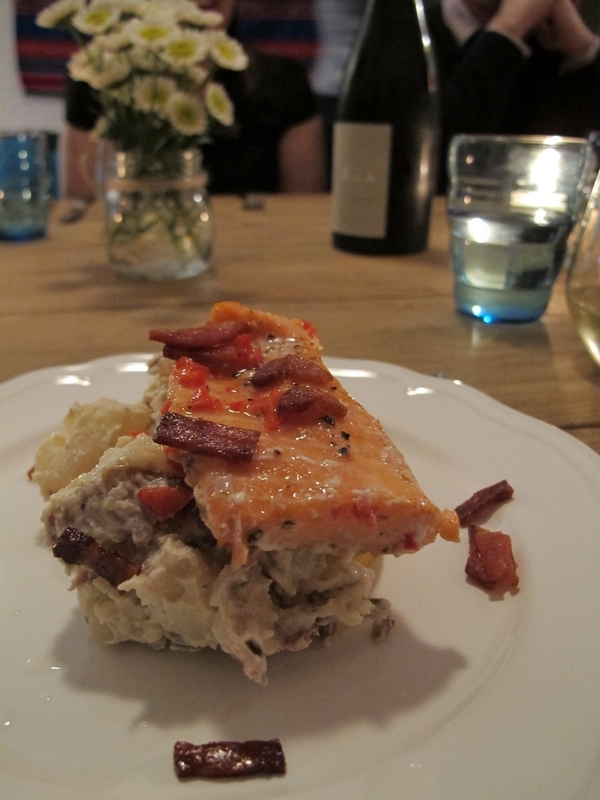 Our first course was Jethel’s baked trout with toasted fennel seed and bacon potato salad. The dish was named after Andy’s Grandmother. SarahKate explained When Andy was a child and would catch a trout in the stream near her house, she’d cook it simply with oil, garlic, salt and pepper. Serving it on a bed of delicious, creamy fennel-punctuated potato salad was SarahKate’s own (and in my opinion, inspired) idea. The trout is moist and delicious and for the potato salad I’d employed one of my most hated food words, ‘moreish’. Lucky for me Mi Casa Su Casa has a ‘second helping policy’- second servings are encouraged. Next was the part of the meal I’d been dreaming about forever- chicken fried steak. One of my best friends is from Texas, and she’s been regaling me with tales of southern food, specifically ‘good Mexican’ and chicken fried steak, for years now. For the uninitiated, ‘chicken fried’ basically means ‘cooked in the style of southern fried chicken’ – ie, breaded and deep or shallow fried. There is no actual chicken involved, which surprises a lot of people. You can even get chicken fried bacon. So basically chicken fried steak is like a beef schnitzel. I wasn’t sure what to expect, I guess I’d assumed deep frying was for a cheaper cut of meat (a kind of ‘why would you ruin a perfectly good cut of steak’ mentality). Boy was I wrong. SK’s chicken fried steak was made from a grass-fed angus fillet that she had her butcher slice and flatten into rounds. It blew my mind. The steak was oh-so-tender, thick and juicy and perfectly cooked. 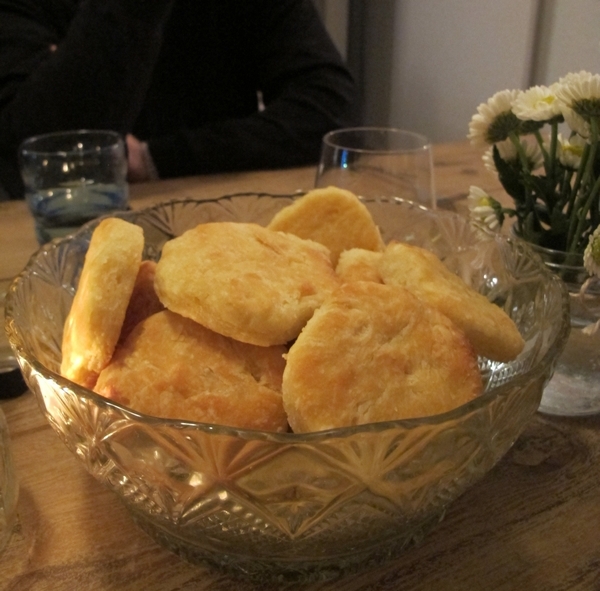 There was a crunchy outer coating of crisp bread crumbs and a slathering of sausage gravel, which I soaked up with biscuits (think savoury scones, with a much higher fat content). I ladled on some more gravy, chow-chow (a zesty southern pickle), gorgeous asparagus and black-eyed beans, all delicious. But for me, the steak was the thing. 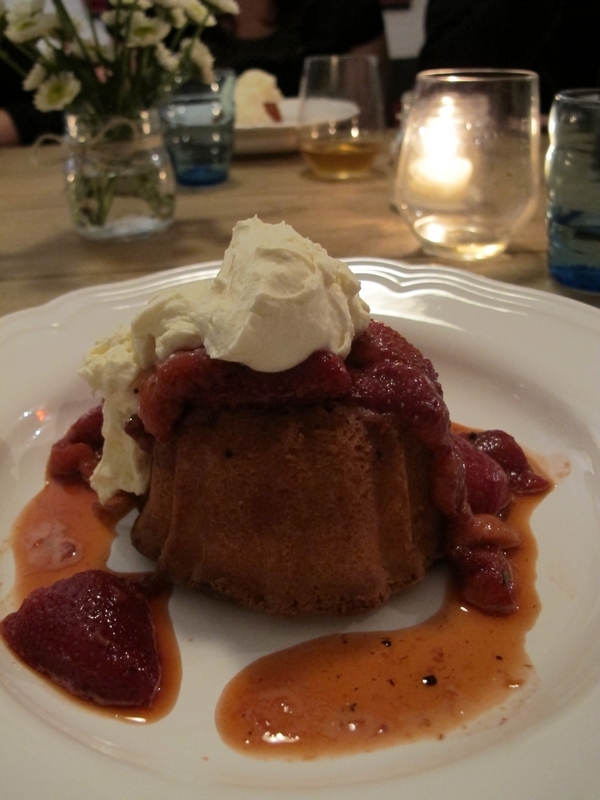 The final delicious course was a strawberry shortcake with a difference. Mini sour cream pound cakes were drizzled with balsamic and peppercorn roasted strawberries and adorned with lashings of vanilla whipped cream. This was the point in the meal when I though I wouldn’t be able to finish the last few mouthfuls, but I bravely soldiered on in the name of food. One of the things I absolutely loved about the night was how every recipe had a little story or explanation to go with it. There was nothing contrived about this, nothing pretentious, but a lot of thought had obviously gone into it, as with every other aspect of the meal from start to finish. SarahKate was eager to know what we thought of the whole thing and in between finishing off the dregs of our wine, we declared it a triumph. I think Mi Casa Su Casa will do really well. Case in point, they are more or less fully booked until the new year. If you get a chance to go, I would highly recommend it. Mi Casa Su Casa accepts donations at the end of the meal. Meals are byo with a drink on arrival. It sure was a great night and the food VERY moreish. Sorry, had to be said. Not as bad as that nom word. It was probably a good thing I was dropped at home otherwise, after all that great food, I would have collapsed in a park somewhere to digest it a little. It was *such* a good night, I agree. I remember reading about somewhere else in Sydney that was doing something similar just before I left to move down here. I thought it sounded like a grand idea and this one indeed looks wonderful! Where do we sign up? I love and miss Southern food! Yay! What a nice write up… thanks a ton. We had a blast with you guys and the subsequent dinner was super fun as well! No worries! Every word I wrote was true. I LOVED every minute of dinner at SarahKate & Andy’s. I felt SO welcomed into their home that I honestly didn’t want the night to end.